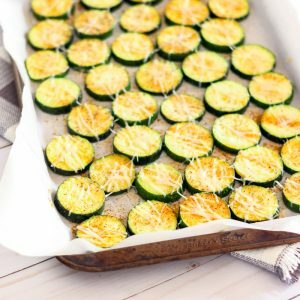 Easy, oven baked zucchini that's tossed in oil and spices, sprinkled with fresh grated Parmesan and roasted to perfection! Preheat oven to 375 and line a baking sheet with foil or parchment paper. Place zucchini rounds in a medium sized bowl (or gallon Ziploc bag). Add oil and spices to bowl and toss zucchini to coat.